Prior to kick off both sides were probably quietly confident that they had the firepower within their side to win the game. Neither team had fully played an eighty minutes to their potential throughout the build up and both Head Coaches, with contrasting experience, were pleased with their final week’s preparations. In the Red corner was Army Head Coach, Andy Sanger. Though capped himself at Senior level he has made his mark as a coach and is one of the most respected and experienced coaches in the three Services. The 101st Army v Nay Match was to be his last game in charge of the Army team. He had coached them at six previous Army v Navy Matches and had yet to taste defeat. His opposite number, Dave Pascoe, has yet to make his mark as a coach in this his first full season as Head Coach but his playing experience as the Navy’s most capped player is second to none and under his tutelage this year the Navy have shown tantalising glimpses off a playing style that is both exciting to watch and effective. The early exchanges showed that both coaches had done their homework. The breakdown was being fiercely contested as neither side wanted their opponent to have quick ball. Both sides were prepared, in the opening minutes, to kick tactically for territory rather than risk being isolated close to their own posts. It was the Army who were first to put the ball through the hands and work right wing, Connor O’Reilly, in to what looked like a little space. It proved to be an illusion though as Jon Humphrey and Eldon Myers combined to make a dominant tackle to end the building threat. 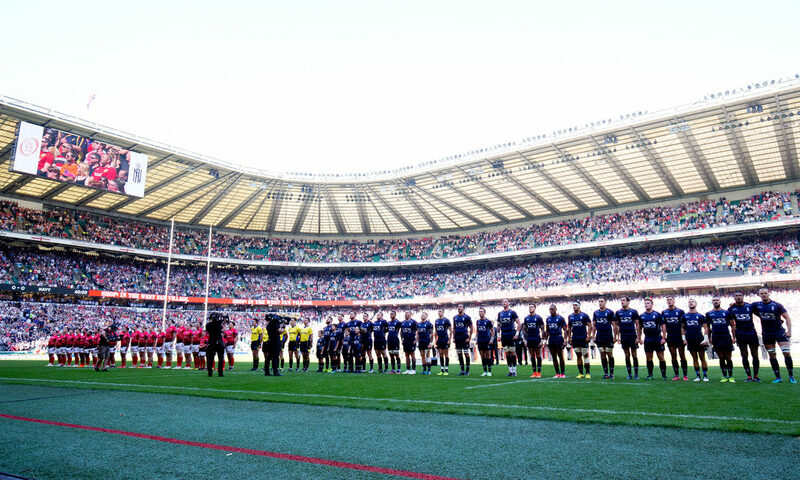 The tackle lifted the decibels in the sold out Twickenham stadium and it was the Navy supporters who found they voice. This lifted the team and soon they were beginning to exert a degree of control and sustained pressure. The Army clearly knew the threat that the Navy had when utilising quick ball and they were lightening fast out of the blocks in defence. Too fast though and assistant referee, Jack Makepeace, twice fed in the offside call to give Jon Humphrey a couple of simple kicks at goal and take the Navy into a 6-0 lead. Then a moment that every coach dreads turned the game. 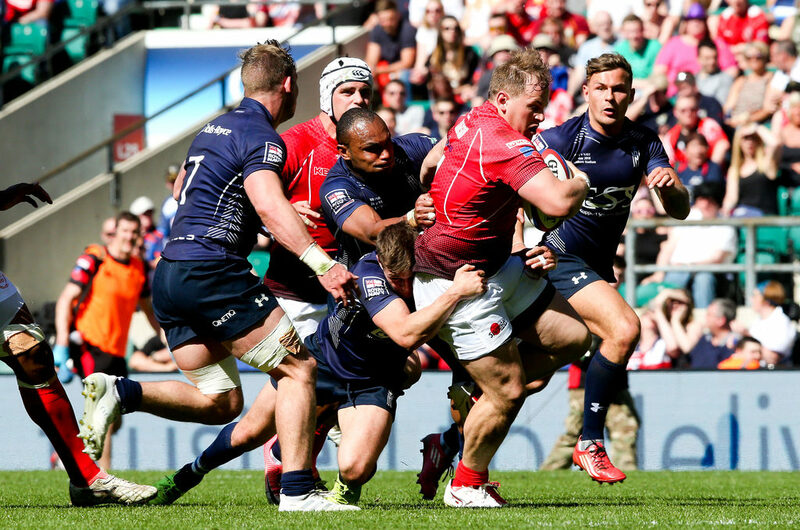 The Army set up the maul and with a powerful surge made good ground deep in to the Navy half. Sam Matavesi collapses the maul and then Tim Wigglesworth’s whistle blasts long and loud for the penalty. At this stage it is quite likely a yellow card but as has happened so often in an Army Navy Match a comment is made by a Navy player, a push from an Army player and a scuffle breaks out. Players pulling and pushing, it has been seen many times before. In days past the referee would probably have stayed with his original penalty but now with technology the television match official was asked to review the cause of the scuffle. It was a long review and at the end of it all it was Matavesi who was called over. 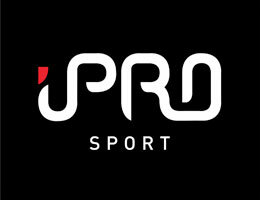 Not a yellow card for the collapsed maul but a red for a strike with the head. A blow for Sam but also for Pascoe up in the stands who now had to plan a strategy to play 62 minutes with only fourteen men. The key thing was to try and remain composed and well structured, at least until half time when the side could regroup. However, that second quarter was to prove game changing as James Dixon’s side raised the tempo of the game and played with pace, width and variety. Strong running from Miller, Bean and Dowding in to the heart of the Navy defence was giving Morgan Evans quick ball at half back. Dixon with time is a masterful tactician and a mixture of kicks and switches of play were beginning to pull the Navy out of their defencive shape. First they made space for Chris Leathem to cut an outside arc through the defence to score the opening try which Dixon was unable to convert. And this was followed not long later by a similar play to free Junior Bulumukau for a trademark flamboyant dive in to the corner. With Dixon converting the Army enjoyed lead in the match for the first time, 12-9, with Humphrey having added a 3rd Navy penalty between the two Army tries. 12-9 at half time might have been acceptable to Pascoe who would have the ten minute break to re-programme his team’s plans. For a while it looked as if they might hold out but it was evident that Andy Sanger had clearly put the message on to keep the pressure on for the full forty minutes. It was noticeable that the Army were looking to keep the ball alive, speeding up the lineouts, keeping the ball in hand. Would the risk pay off? 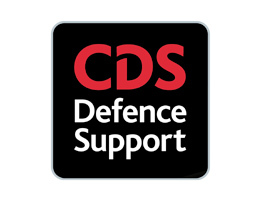 Could they break the determined resistance of the Navy defence? The answer to both questions was yes as man of the match, Matt Dawson, crashed through the first up tackle to break deep in to Navy territory. Possession was maintained and the Navy were scrambling hard in defence but could not slow the ball down. 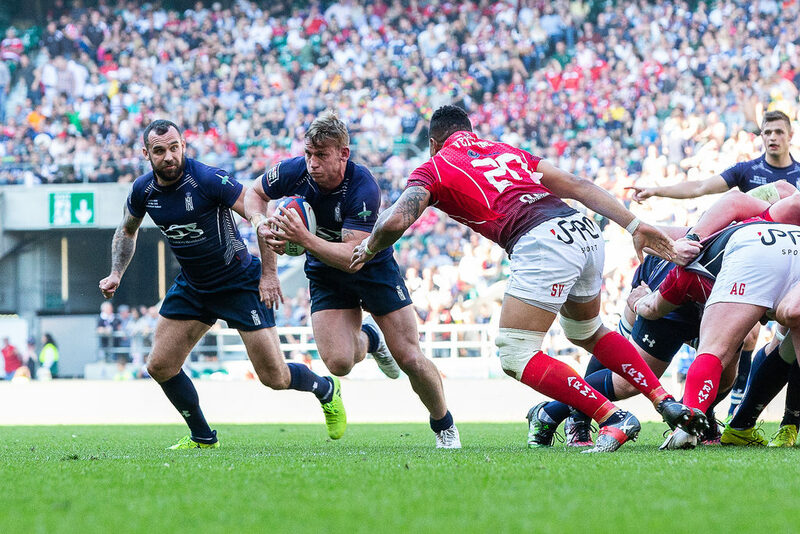 Eventually as the Army forwards drove ever closer to the Navy’s goal line it was the long arm of flanker Jamie Miller that reached out to score the third try from under a pile of bodies. Dixon added the two points and the Navy knew they would need a massive effort in the second half to recover from the 19-9 deficit. The second half was a contrast to the first. A Dixon penalty seemed scant reward to the start they made. Only superb cover defence from Rhys Dimmock-Williams had denied Connor O’Reilly a try in the corner whilst Dixon himself had missed an earlier penalty attempt. Their opening salvoes could easily have produced 10 points but instead the Army had to content themselves with a 13 point advantage. 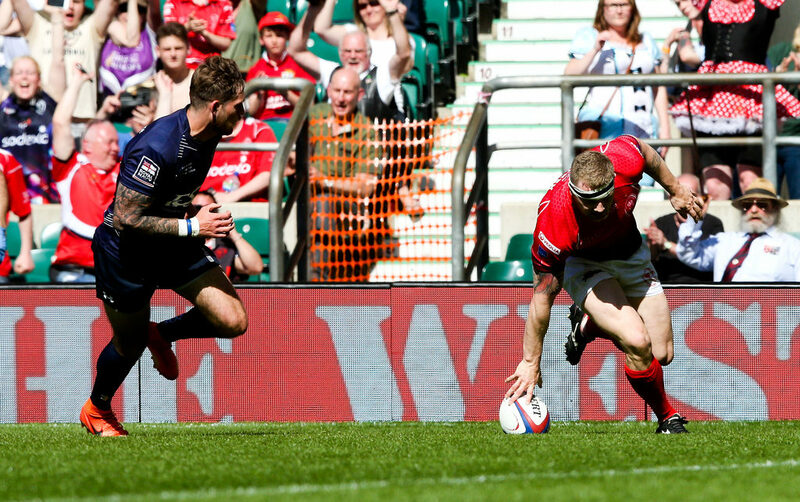 It has been an Achilles heel of the Army all season that when they have a good lead, though not necessarily a match winning won, they seem to ease back and stop playing the exciting brand of rugby that earned them the lead. As at RAF Halton in round 1 they again struggled to maintain their intensity and retreated in to their shell. As with the RAF 4 weeks before it allowed the Navy to get back in to the match and start enjoying the majority of possession. Gradually their forwards aided by their fresh leg replacements started to take control of the breakdown and the Army were forced in to some desperate defending. The Navy needed to score quickly to further increase the pressure on the Army psyche but though they came agonisingly close twice the television match official correctly ruled against them with first Jarrad Hayler and then Seta Raumakita thinking they had scored. Time was ebbing away as the Navyknew that two scores were needed. The pressure continued to build and the Navy were rewarded late on when after some good continuity they created the opening to send replacement backrow forward, Ratu Vakalutukali, flying over for the try. 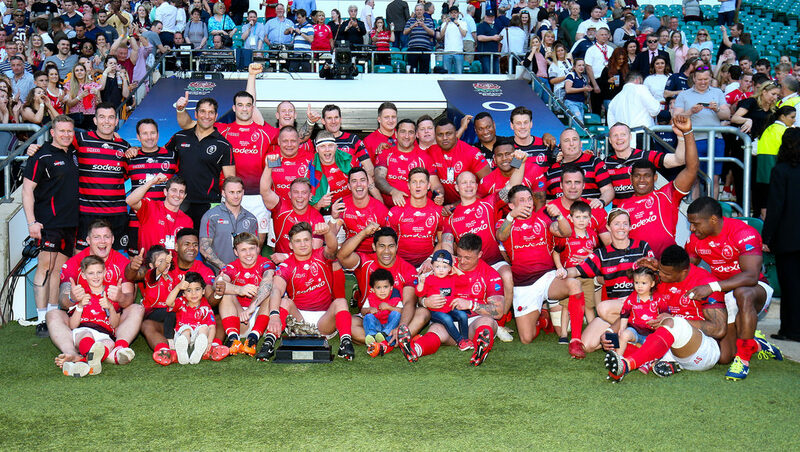 A conversion would bring the match to within a single score and give the Navy a glimmer of hope but the kick was missed and with it the Babcock Trophy remained in Army hands as they equalled their longest unbeaten run of 8 years and recorded their 62nd victory in the 101 match series. They also ensured that head coach Andy Sanger had the perfect send off as he swaps Army rugby for Premiership rugby with Harlequins. So next year, the 102nd match will see a new Army Head Coach. Dave Pascoe will have gained a huge amount from his first season and first Army v Navy Match as a head coach and not a captain or player. In games that have such small margins that extra experience might be all that is needed. Only time will tell but he will be focussing fully that the Army do not go 9 years unbeaten. He has been in that position before as in 2010 when again the Army were looking to take the record to 9 years it was Dave who captained the side that snatched a victory in the dying minutes. The try scorer that day was Gaz Evans, now coaching alongside Pascoe. So they know that it will take a great deal of hard work but they have done it before and the Navy supporters would so dearly love it if that could repeat the feat on 4th May 2019.